The Gisborne Eastland region stretches north and eastwards from the Mahia Peninsula to the Te Urewera National Park and includes East Cape, also known as Eastland. The region is the part of New Zealand land mass that is most to the east and it is on the North Island. This region was witness to many of the New Zealand land wars conflicts in the 1860s and has a lot of history. 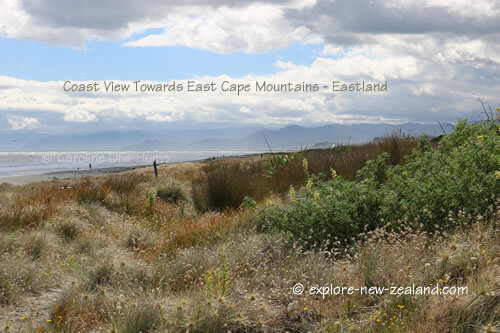 Most of the land in Eastland/East Cape is in Maori ownership and the way of life there is said to be more relaxed than elsewhere in New Zealand. For touring, the Pacific Coast Highway SH35 covers 330km around the coastline of the peninsula and if the weather is good can provide some stunning coastal views during your drive. Inland there are opportunities for hiking but be aware that some of the land is Maori land and you should first seek permission if you want to cross it. Visitor centres in towns should be able to provide you with information for hiking that is permitted in this region.